Inside the iPhone 7 family's chips – and why isn't Apple using these in its MacBook Air? iFixit and Chipworks have done their usual teardowns of the new handsets, revealing the electronics, components and silicon used within. Apple's ARMv8-A-compatible, TSMC-fabricated A10 "Fusion" main processor with embedded M10 microcontroller that processes and stores sensor data. The A10's die is 125 sq mm in area, and has 3.3 billion 16nm FinFET transistors. It appears to use TSMC's integrated fan-out (inFO) technology to keep the chip as slim as possible, increase performance and dissipate power better. It does this by removing a substrate layer between the RAM and logic die stack and the layer of connecting pins underneath. The A10 has two beefy ARM-compatible cores and two smaller cores for lighter workloads, sorta like ARM's big.LITTLE architecture. This is Apple's first homegrown quad-core system-on-chip. The die shot below, taken by Chipworks, shows the layout although the labels are wrong: there are two large cores and two smaller ones. Half of the A9 CPUs in the iPhone 6S were manufactured by Samsung and the rest by TSMC; Apple could be doing a similar split with the A10 but only if Sammy can match TSMC's inFO packaging. The iPhone 7's A10 logic die has 2GB of Samsung K3RG1G10CM LPDDR4 RAM sitting on top of it (3GB in the 7 Plus). The memory is not stacked particularly high; instead, it's split into four dies that are spread out over the top of the A10 to reduce the height of the overall system-on-chip package. There's 32, 128, or 256GB of onboard SK Hynix or Toshiba flash storage, depending on the model, built using a 15nm process node. The 256GB is said to be using 3D NAND from Samsung, Micron-Intel, or Toshiba. 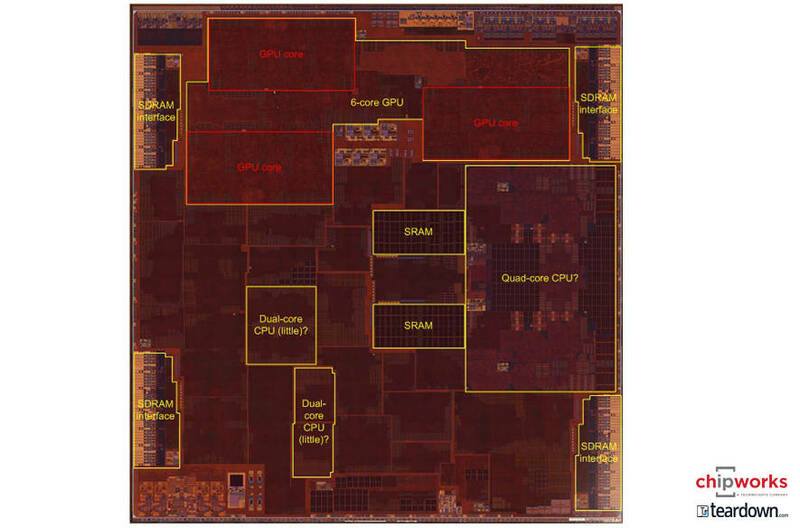 Among the usual Texas Instruments power control, Broadcom GPS and NXP NFC chips, there's a Lattice Semiconductor ICE5LP4K FPGA and Murata Wi-Fi controller, and the Apple-Cirrus Logic 338S00105 audio codec as found in the iPhone 6S. The battery is a 3.8V 1960mAh (7.45Wh) part, half that of Samsung's exploding 15.4Wh batteries in its Galaxy Note 7. Phones with Qualcomm X12 modems use Qualcomm transceiver chips, and those using the Intel XMM 7360 use Intel's transceivers. So how good is the new 2.3GHz quad-core A10 CPU in the iPhone 7 and 7 Plus? Apple claims it is 40 per cent faster than the A9 in the iPhone 6 range, and the hexa-core GPU in the system-on-chip is 50 per cent faster compared to the previous generation. According to GeekBench benchmarks, the iPhone 7 has, on average, 37 per cent more raw performance than the iPhone 6S Plus in single-core tests, which is close to what Apple claims, and 32 per cent faster in multi-core performance. Interestingly, the user-submitted GeekBench figures for the A10-powered iPhone 7 are on par with or outstrip the numbers for Apple's 13-inch MacBook Air laptops that use dual-core 1.6GHz Intel Core i5 processors. Compare the iPhone 7 and Core i5 MacBook Air. In one GeekBench submission, a Core i5 MacBook Air scores 2,830 and 5,454 for single and multi-core tests, respectively, while an iPhone 7 hits 3,461 and 5,610. The iPhone also performs better at realistic tasks, such as HTML5 and PDF rendering, too. Apple's 13-inch 2.2GHz Intel Core i7 MacBook Air notebooks stomp over the iPhone 7 in terms of multi-core performance and real-world tasks. However, the close race between the A10 and the Core i5 has been enough to fuel speculation that Apple will dump Intel's x86 processors from its laptop line in favor of homegrown ARM-compatible system-on-chips, now that their performance is coming on leaps and bounds – especially when moving down to 16nm FinFETs. "CPU benchmarks are like statistics: to paraphrase an old saying, 'there are lies, damned lies, and benchmarks'," Mark Hung, a Gartner research veep, told The Register this week. "What is more useful than raw CPU benchmarks are real-world use cases: for example, how fast do the same games run on either processor; now that there are iOS versions of Microsoft Office, how quickly can the same spreadsheet be recalculated on either processor; and so on. We'll soon be able to run those tests when the iPhone 7 comes out, but for now I wouldn't overstate the importance of these benchmarks." "There have been rumors for years about Apple potentially switching to ARM for its notebooks, but I don't believe that will happen in the next two to three years," said Hung.